What is the best way to spend a hot summer’s day in the Catalan capital? We can’t think of anything more fun than splashing around in a cool water park. A day at the beach is always a good option, but the water parks near Barcelona are even more exciting, and are some of the best in Europe. Pack a bag, put on your swimsuit and sunscreen, and choose which one of these popular summer destinations most takes your fancy. Let your inner child loose and spend an awesome day on a variety of exhilarating rides and slides! One of the favourites here in Catalonia is always Illa Fantasía, just a 25 minute drive from Barcelona. 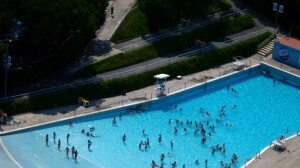 There are 23 attractions and three big pools, so expect a blast! 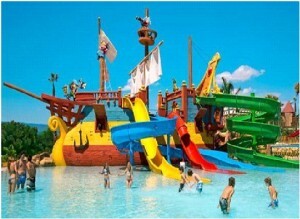 Some of its top attractions include the Torpedo ride and Pirate’s Lagoon aquatic adventure trail. They have plenty of water slides, including the Kamikazee, which has a steep drop. And after a long day of trying out all the aquatic games you could refuel at one of the several restaurants inside the park. Location: Finca Mas Brassó, Vilassar de Dalt. Prices: 16,50€ under 1.2m, 26€ over 1.2m. Free buses and trains leave from Barcelona every day. Located on the Costa Brava in the Lloret de Mar resort, Water World is exactly as it sounds. It has many enticing rides and pools and has everything from a Family Lagoon for a more relaxed experience, to the Water Mountain and Riu Salvatge for those feeling adventurous. 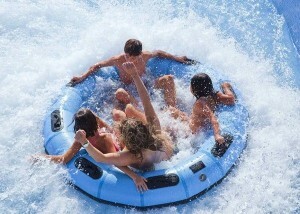 Rafting is even on offer at this cool water park near Barcelona. Several special areas for children are perfect for the youngsters, too. Location: Ctra Vidréres km 1.2, Lloret del Mar. Free bus service from Lloret de Mar, Tossa de Mar, Blanes, and other locations. Prices: 17€ under 1.2m, 30€ over 1.2m. This water park creates a truly unique experience. There are two separate areas in Aqualeon where the entire family can have fun: the water park and the safari park. The Anaconda slide will release your inner adrenaline junkie, while the Crazy Race slides allow the whole family to get involved. 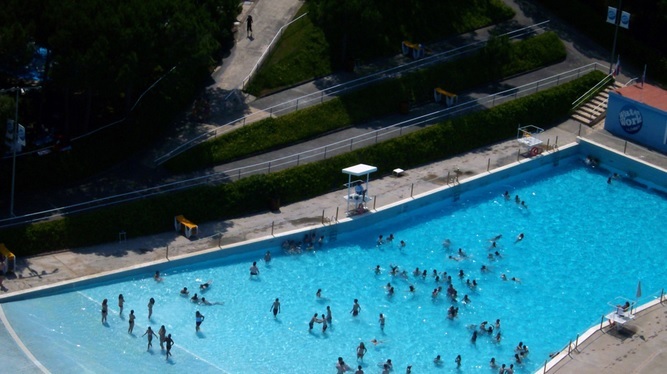 If you feel like relaxing, head over to Surf Beach, one of Spain’s largest pools. After all that water fun, you can take a safari bus through a prairie filled with tigers and bears – oh my! Finca les Basses, Albinyana. Bus service from Sitges, Tarragona and other locations. Prices: 8€ from 0.9m to 1.1m, 15€ under 1.4m, 24€ over 1.4m. 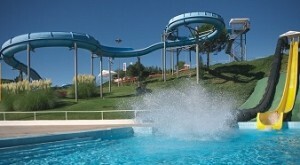 Located on the Costa Brava, the Aquadiver water park has some truly thrilling attractions. 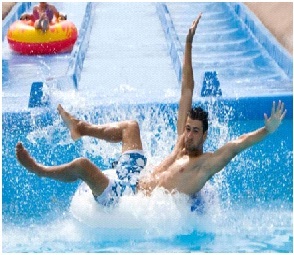 Check out the Waterfall slide that shoots you through a covered tube at an exhilarating speed. The Rio Rápido is the perfect family ride; it’s a long river with twists and turns and two surprise waterfalls. To truly relax after a tiring day, you could spend some time in one of their calming hot water and bubble pools. Location: Carretera Circumval-lació S/N 17250 Castell-Platja D’Aro. Free Bus service from Palamós, Sant Antoni, Platja d’Aro, S’Agaró, Sant Feliu de Guíxols and l’Estartit. Price: 17€ 0.80-1.20m, 30€ over 1.20m. Although best known for its theme park, PortAventura has an equally fun water park called Costa Caribe Aquatic Park. Some areas are more suited for children, such as Sesamo Beach, where you can find a shallower pool and kid-friendly rides. The more adventurous should check out the King Khajuna water slide, the tallest free fall slide in Europe. But wait, there’s more! Your trip would not be complete without climbing to the top of famous Barracudas water slides and winding down their curvy slopes. This entry was posted in Activities, Home, Summer and tagged activities barcelona, barcelona day trips, barcelona with kids, portaventura barcelona, portaventura theme park, summer in barcelona, theme parks barcelona, travelling around barcelona, water parks barcelona. Bookmark the permalink.